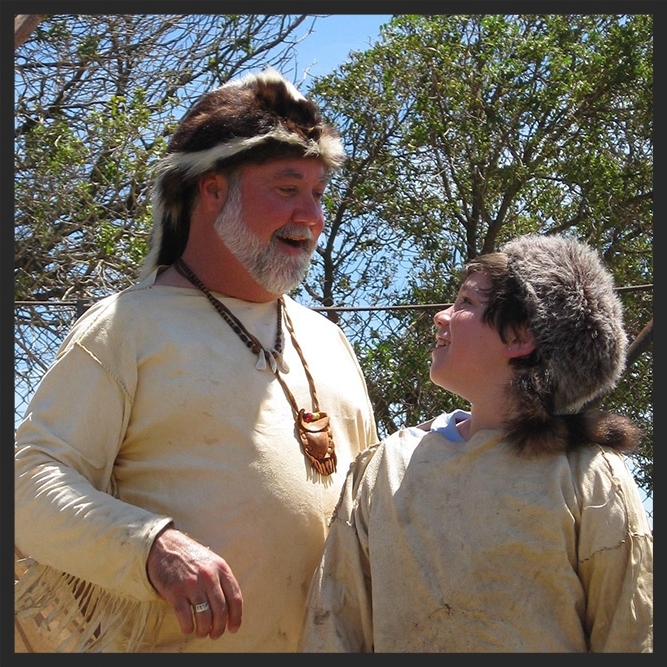 One of the most meaningful WOLF activities is our hands-on Primitive Living Skills program in which the students experience life as it was during the time periods they are studying in history class. 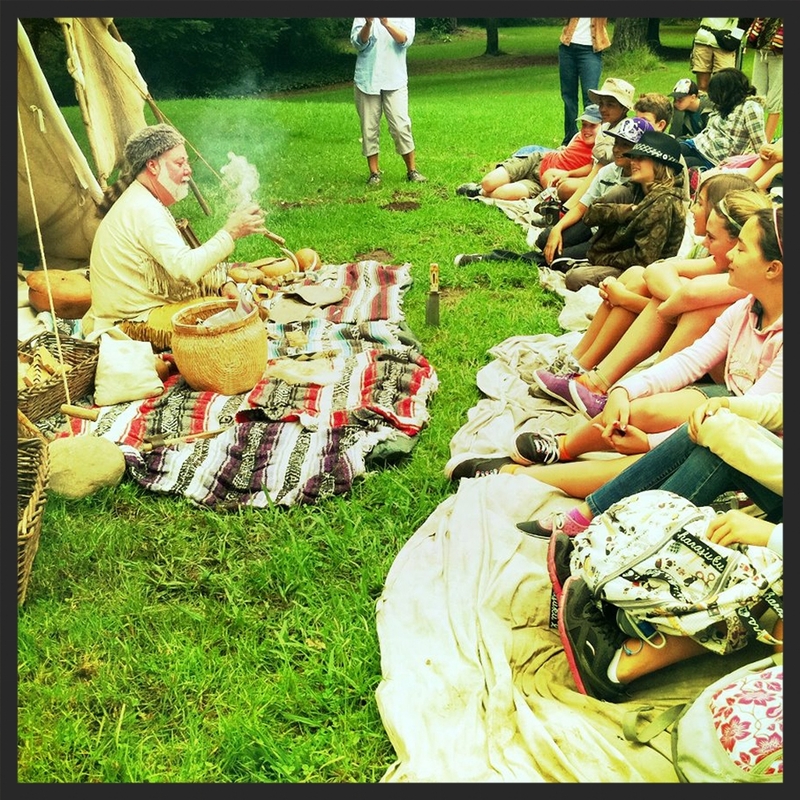 WOLF naturalists dress in period costume to demonstrate native cultural skills such as fire building, food preparation, primitive weaponry, and crafted tools. Students make friction fires, build a wikkiup village from willow, make corn cakes, make and shoot arrows, as well as fashion medicine bags and dream catchers. Create a meal from things found naturally in the environment, build a friction fire, make and shoot a real arrow, build a shelter, knap an arrow head, and learn first hand the survival techniques of our ancestors. These interactive, hands-on activities are excellent for all ages and abilities. Below are some examples. WOLF staff, in authentic period costume, demonstrate primitive fire building, food preparation, primitive weaponry and crafted tools. Students are instructed in traditional archery skills and taught proper technique to ensure safety. Traditional cane arrow making techniques are also taught to provide the students with the skills necessary to create effective ancient hunting tools. Small pouches were worn about the neck by many groups of Native Americans. Participants will have an opportunity to design and create a similar bag. Almost any small item could be placed inside. Sometimes medicinal herbs were kept inside but more often there were small objects representing the possessor’s totem plants or animals. The translation of Native American concepts into the western word “medicine” is not the same. Anything that would be helpful physically, emotionally, or spiritually to the individual was kept safe in the medicine bag. The art of cooking outdoors with no pots and pans is rapidly being lost. Participants will grind grains or corn into a fine flour and mix into a batter and then cook on a piece of oiled slate. The habits and habitat of a variety of animals are taught in order to increase participant’s viability in the wild. Principals of camouflage and scent masking are combined with hunters' “tricks of the trade” and traditional games such as “drum stalk.” The ability to identify animal tracks and other signs are taught in order to form a mental picture of animal behavior, essential to hunting and trapping. Students are taught to identify natural fire making materials in the wild and use them to build a fire without modern assistance. Hand and bow drill methods are taught in order to promote independence and confidence in one’s ability to survive in the wilderness. Students divide into smaller groups to build a village of real Wikkiup houses fashioned from willow. The end result resembles and upside down basket. This framework was traditionally covered with several cubic feet of cattail leaves, but it can be covered with variety of other materials. Groups will create their own shelter and a village, serving as the central meeting place throughout the PLS program. People of any age find this shelter building to be fun and relaxing. There is nothing like the sound of a tomahawk landing solidly on a pine stump target. This ancient warrior skill is taught using specially designed target hawks. It is a time honored trapper skill once part of competition at the mountain man rendezvous of the early 1800’s. Students use primitive pump drills to bore holes into shells to make jewelry. Shells get strung onto natural fibers then adorned with beads to create unique personalized designs. Students get to keep all crafts they create. A Native American legend tells that all dreams are caught in the dream catcher. Bad dreams are caught and held by the web until destroyed by the first rays of the sun. Good dreams find their way to the hoop where they enter the life of the dreamer. Students will spin their own dream web and personalize it with shells, feathers, and beads. Almost any meat can be slow smoked to ensure its longevity as a food. The meat is sliced thin, seasoned and hung on racks. A smoky fire is set beneath it and in a few hours delicious jerked meat that can be enjoyed up to several weeks later. Students will build the racks and the create the twine to hang the meat. Once prepared, they will also have to tend to the fire to ensure the smoking process. This may also be adjusted to include the Frontier Outpost Camp, exploring the customs of early American settlers and pioneers. Two person buck saws, candle making, curing smoked beef jerky, and donut making are a few examples of our Frontier Outpost Camp activities. All the activities are structured around bringing students closer to their ancestral history. Whether it is throwing a tomahawk or grinding up corn to make a delicious treat, our goal is to teach students what life was like living in an age of simplicity; combining that with a sense of community that working together as a tribe brings prosperity and self worth. PLS can be applied to any of our top 10 programs!